Are you still with me now that you’ve seen that it truly is a savory dish? *smile* You’re going to put a scoop or two of mashed potatoes in the bottom of the bowl, sprinkle some corn over that along with some shredded cheddar cheese, and pour some hot topping (gravy) with roast beef right over the top. Some people add a small cherry tomato on top to complete the whole sundae thing, but I prefer to not mess with this flavor combination. *laugh* We take several shortcuts with this meal. We make instant mashed potatoes to make this super quick, start with a packaged gravy mix, warm up a bag of freezer steamer corn, and even use thick cut lunch meat. You can make less dishes for yourself if you use packaged shredded cheddar instead of shredding it yourself, too. So, start your gravy and your mashed potatoes. I’m not going to post any pictures of making the potatoes since there’s nothing interesting about that, other than for the two of us (one picky eater and one country boy) plus some leftovers we followed the 3-4 servings instructions. I am going to put a few of the gravy, though, since I found out that some people have never used a gravy mix before. We love McCormick’s Brown Gravy Mix so much that I buy it in bulk. Any country fans out there? Do you have “Good Brown Gravy” in your head now? lol Anyway…I wanted to make 3 cups of gravy, so I used 9 tablespoons of McCormick’s Brown Gravy Mix (if you’re using the packets I’d follow the instructions on there and make two packets worth), and added a tiny bit of water to the powdered mix. 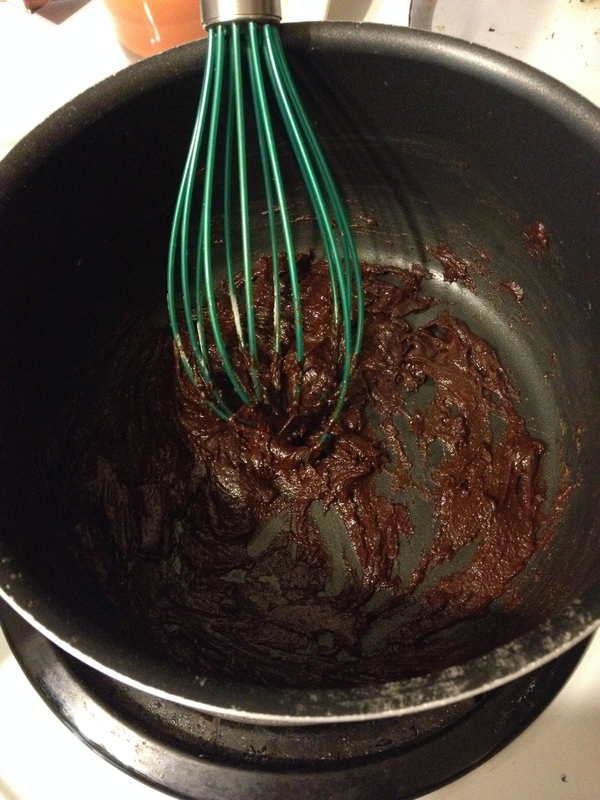 I whisked it until it created a paste and then slowly whisked in the remaining 2 1/4 cups of hot water. Creating the paste and then slowly whisking in the remaining water will ensure that you have a smooth gravy. 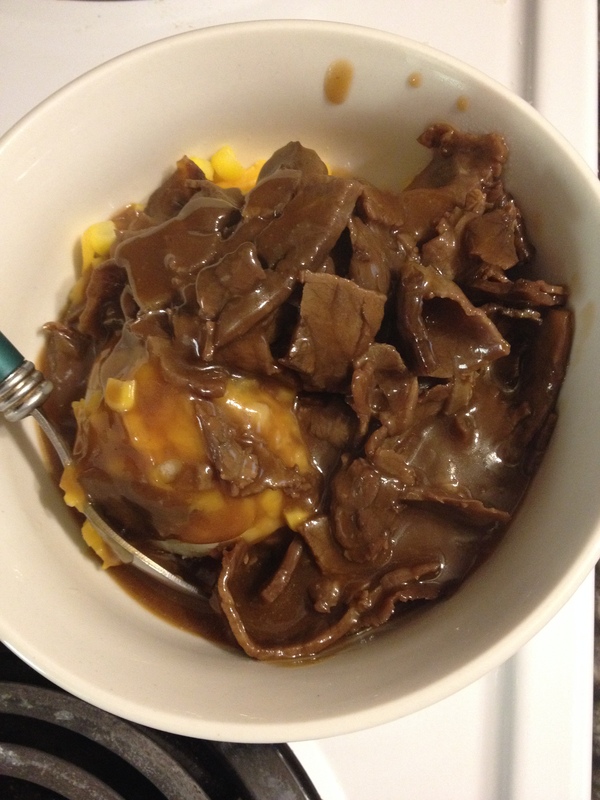 We then chopped up some leftover thick cut roast beef lunch meat, which was then added into the gravy, and simmered the combo to warm the meat up. While the meat simmered in a delicious bath I steamed a frozen bag of super sweet corn and drained it. Once the corn and meat are warmed up, it’s time to build your beef sundae. Pour the meat sauce over and dig in! I don’t add salt since the gravy mix has a sodium kick to it all ready, but the big guy likes to add salt and pepper to his. The last key tidbit I’ll give is that you have to try and get all of the layers in each bite for the best flavor profile. 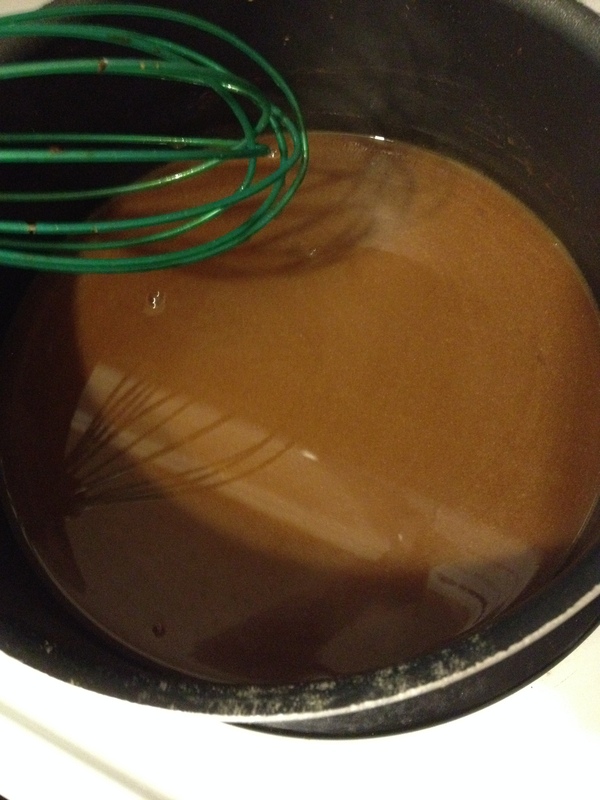 Whisk a tiny bit of water into the gravy mix until it creates a thick paste. Whisk in remaining hot water and bring to a boil over medium heat while stirring frequently. Reduce the heat and simmer about 3 minutes. While gravy is simmering prepare the instant mashed potatoes per package instructions. 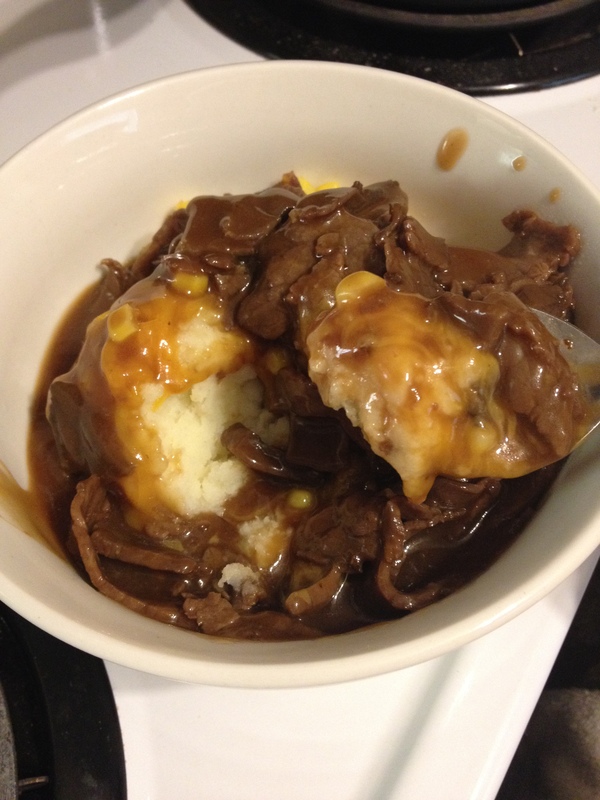 Chop leftover roast beef lunch meat into bite sized pieces and add to the gravy after it has simmered. Continue to simmer the gravy combo until the meat is warmed through (about 3-5 minutes usually). While gravy is finishing steam and drain the corn. 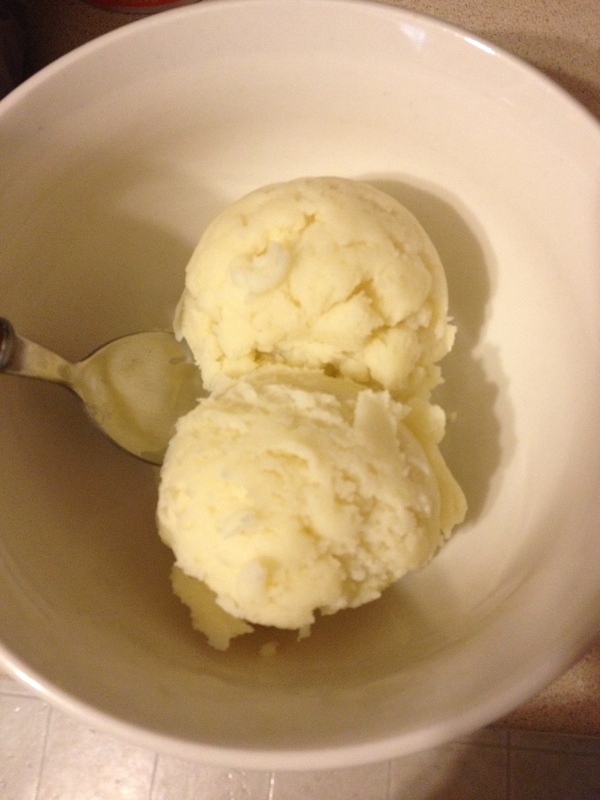 Once the hot ingredients are all heated through build each sundae in a heat resistant bowl, starting with a scoop (or three, per preference) of mashed potatoes. 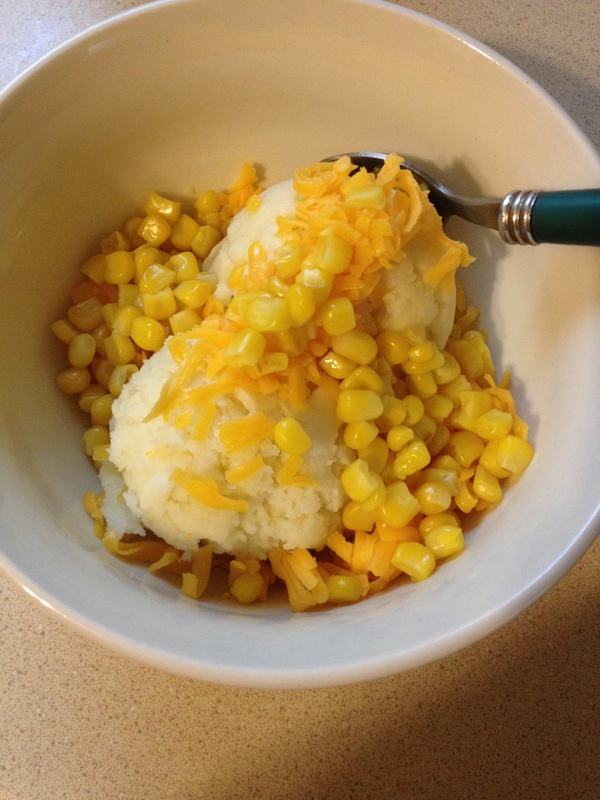 Sprinkle a handful of shredded cheese and about a quarter cup of corn over the potatoes. 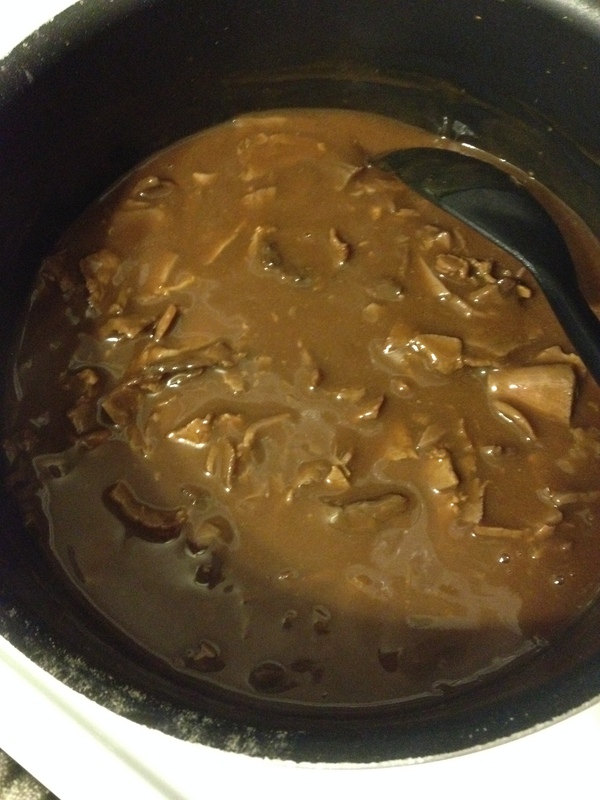 Ladle the gravy and meat mixture over the top. Add salt and pepper to taste, optional. Enjoy! 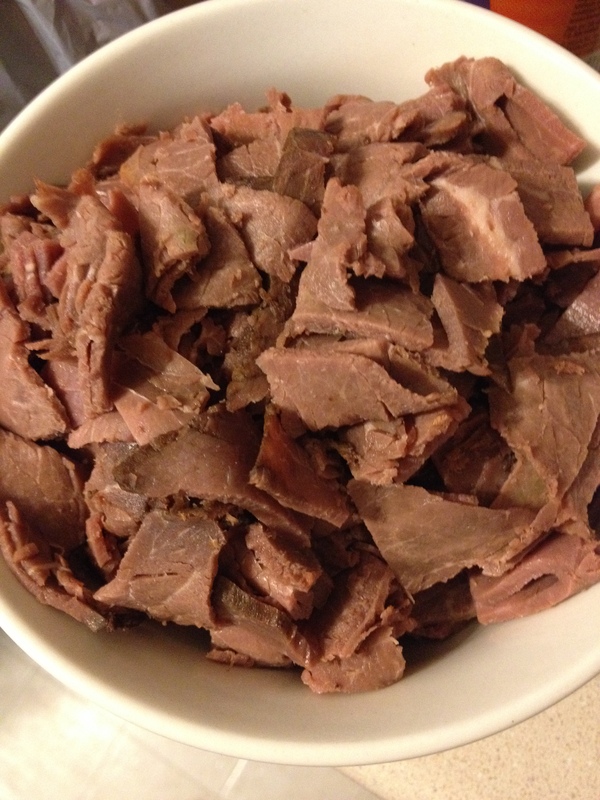 Posted in Recipes and tagged Beef, Easy Meal, Recipe. Bookmark the permalink.